Congratulations Keziah . . . how exciting to be looking forward to the publishing of your first novel . . . .
Norbert is a retired accountant having trouble making ends meet. One day, 3 women from his art league show up on his doorstep. They've noticed his financial predicament, and they think they have the solution: they want him to become the town fortune-teller. And they can teach him how to read cards. Norbert doesn't believe in this stuff and thinks this is a terrible idea. But he is forced to try it, and finds that when he becomes a fortune-teller, people seek him out and listen to him with interest in a way that has never happened before. Then, as it must do, disaster strikes. This is the best thing! Thank you thank you for these insights—every single one of them is life-changingly brilliant. Open mind, light heart, a purpose, someone who loves you, and gratitude. And I agree with Joan—tell us more! Oh, Hank! I love your summary! Well, to tell you more, I can say that writing The Reluctant Fortune-Teller was a joyful experience for me. It made me laugh as I wrote it. I hope that's okay to say. It's a story that I hope will encourage people, or at least make them laugh. I think in today's world, we need laughter more than ever. Lots of valuable insights here, Keziah. I rely on my editor. I feel like I can take risks with the writing and know that she'll pull me back if I misstep. And yes, writing takes the fun out of reading (sometimes). Your book's title is intriguing... reluctant? Suggests all sorts of possibilities. Hallie, I agree with you. Having an editor whose judgment you trust makes it possible to continue the creative process. I know I appreciate mine: Natalie Hallak and Liz Stein at Park Row Books/Harlequin/HarperCollins. When I very first wrote this book, the title was How to Read Fortunes with Cards. When I sent it to my terrific agent, Danielle Bukowski at Sterling Lord Literistic, we decided a new title needed to be chosen. I loved that title, even though, obviously, it could be misunderstood to be a how-to book. I created a short list of other possibilities, and Danielle picked the one she liked best. I'm pleased with it! Yes, titles! Do you have a title story, Hallie? And everyone else, please share your title stories. I love the premise of your story and I can't wait to read it! Good thing I'm not an editor, though: I've often thought while reading some mysteries: "my gosh, does this protagonist ever think about anything other than trying to figure out who the killer is?! Doesn't she ever ask her friends how their day is going or how their families are?! Does she ever go to the grocery store simply to buy groceries and not to interrogate people at the store?" And I've also asked myself "what on earth does this incident have to do with anything else that's going on in this book?" It must be difficult to be a good editor! Thank you, Deborah! The Reluctant Fortune-Teller will be out March 6, and it's going direct to paperback, which I understand is a good thing! More affordable, and more likely to be picked up by book clubs, for which it is perfect, I think. At the end, there are book discussion questions. As to being an editor, yes, that takes a very special talent: attention to detail, being able to see the big picture and small picture all at the same time. I really appreciate mine! Actually, Deborah, in looking again at the questions you ask yourself, I think you would make a good editor--or beta reader. Those are the kinds of questions that have to be asked! Congratulations on your first book, Keziah! I adore funny books, especially mysteries, and this one sounds like it has a great premise. Can't wait to read! One thing, though: Based on your picture, I don't think you could possibly have been in 5th grade 50 years ago! Oh, Mary, I went through a lot of pictures before I picked that one. Let's just say that. But bless you for giving me a happy start to my Saturday! I adore funny books, too! I find that I seek them out more and more as time goes on. Mary, what are some of your favorite funny books? I like the Spellman file series, Anne George's books, Laura Levine's Jane Austen series...I'm sure there are others, but they're evading me right now. Any suggestions? Oh, and Rhys's Royal Spyness series, of course! Thanks for these titles! My favorites are mostly (or all?) English, and from the 1930's or so. Cold Comfort Farm. My Man Jeeves. Queen Lucia. Miss Buncle's Book. These are charming books that make me laugh and feel good in general. Oh, and Whistle Down the Wind by Mary Hayley Bell. HI Keziah! I'm reading your book right now and really enjoying it. I'm really lucky with my editors. They love everything I write and make great suggestions. I've even had excellent copy editor and proof reader for my upcoming book. It would be really hard if an editor didn't share my vision. Rhys, I am so glad--and complimented--you are enjoying Norbert's story.That is my aim: to give enjoyment in a heartwarming story. I love your books, and find myself laughing out loud when reading about Georgie and Molly. I love books that do that for me. Do you have a "beta reader" or anyone in your life that reads your work before you send it out? Or do send it directly to your agent or editor? And when will your next book be out? Keziah, there is another wonderful series by Rhys Bowen. I think you will love the Constable Evans series. it is set in Wales. That was my introduction to books by Rhys Bowen. Diana, Thank you for this! I have seen mention of it, of course. How does one author write 3 series? Are they all written simultaneously? My intro to Rhys Bowen was Malice at the Palace, and since then, I cannot get enough! Keziah, welcome to Jungle Reds! Have you read Care and Management of Lies by Jacqueline Winspear? There is a character whose name is similar to yours. I think it's spelled Kezia. Thank you for sharing your experiences. It is wonderful to have a positive encourager. Your new book sounds interesting. I am adding your book to my TBR list. Often new books that are mentioned on Jungle Reds are easier to find in the library, which is great! I notice that a good editor can make a difference. There is an author whom I really like. Her early novels were wonderful. For some reason, I was disappointed by her last three books. Perhaps there was a different editor for the last three Fiction books? The most recent book by this author was for Young Adult and I loved it! I think she had a different publisher and different editor? There was another author, who is self-published. The two non fiction books were not edited well, despite having a Master's Degree and a spouse who is a university English Professor! Lucy/Roberta, thank you for introducing us to Keziah. Thank you, Diana, for adding The Reluctant Fortune-Teller to your TBR list. No, I am not familiar with the book you mention. Keziah is an unusual name. It can be pronounced 2 different ways. Mine rhymes (sort of) with Uriah, Mariah, or Jeremiah. Yes, editing is so important. It is distracting to the reader, I feel, when the book has not been well-edited. As an author, it can be tough to be asked to change things, but in the end, what we all want is a book that is a joy to read. Thank you for your lovely comments, Diana! 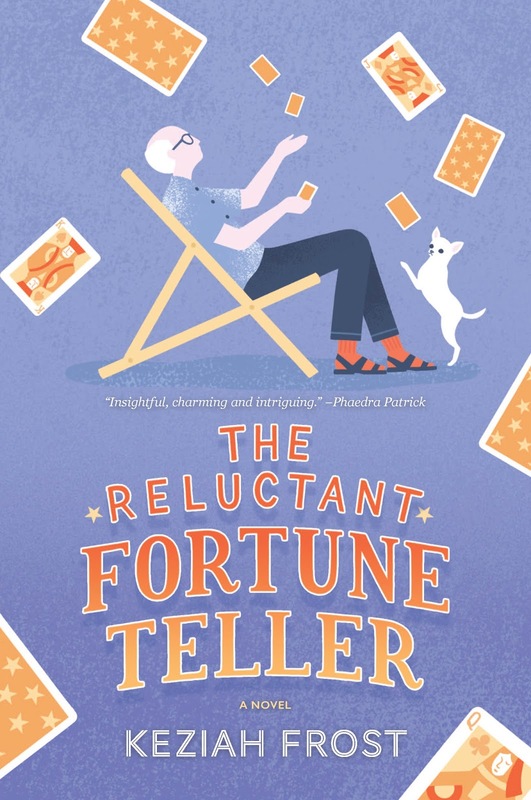 Keziah - THE RELUCTANT FORTUNE-TELLER sounds delightful, and I love scenes that exist only to be funny! My editor likes them a bit less, however, so I have to pare them down. Your reflections on the ways to approach editorial notes and rewriting are spot-on. I love your reminder to "keep a light heart" - sometimes it can feel frustrating that your agent or editor just doesn't get what you're trying to do. It's so important to remember everyone is on the same team: Team Good Book! Ha! Yes, let's give it a name: "Team Good Book." I just saw an observation on Twitter: "Every time you find humor in a situation, you win." Now, I'm not sure if that's 100% true, but wouldn't it be nice if it were? Here's one thing I do believe: You can say everything in a funny book that you can say in a sad or scary one. Nothing wrong with sad or scary; we need all our emotions. But I must say I like "funny" very much. It's like a favorite color. Julia, I relate so much to your comment. I think it's when we feel that "they" don't get us, that we need to take a time out. Later, with a calmer mind, we can come back and approach it all again. As a member of "Team Good Book." Have you ever found that bits you had to cut could be used again in a different work? Work those funny scenes in, Keziah! We need humor. Is Norbert's adventures a stand-alone or the start of a series? Pat, do you, as a reader, prefer series to stand-alones? That's a hard question! When I fall in love with a character I want more! But then again some stand-alones are perfect and complete as they are. I feel the same. I do often have the feeling of enjoying a fictional world so much, I want to return there. Yes, Pat, we do need humor! For now, Norbert's story is a stand-alone. However, up the road...? I hope that readers will want to read more about his quirky friends and his lovely tourist town in New York state, and the dramas they can create for themselves. However, the book I am currently writing is another stand-alone: whole new setting and cast of characters. What a delightful post and fantastic attitude toward editing. I'd say you summed up the process brilliantly. After my first book I learned to look for my darlings and ruthlessly murder them, unless they had a purpose. Alas, picture hand dramatically thrown to forehead in despair, it is the price we pay. Looking forward to reading THE RELUCTANT FORTUNE TELLER. And learning how you came up with your very unique pen name! Well, Kait, does one ever get used to killing one's darlings? As for the unique pen name, I can tell you the story. As a teenager, I hung around in an old cemetery quite a bit--and this was a very long time before the goth teenagers came along. I just liked the sense of life there, if you know what I mean, and the grave stones which often had little narratives about the person, or cautionary tales about what they died of. I really liked the stone of a girl whose first name was Keziah. I would always visit her first. My, isn't this a good Halloween story beginning? As for Frost, well, after an unusual name like Keziah, you need something familiar, one-syllable, that makes an image, and sounds literary. Frost, of course! Until relatively recently I would have given a blog or an article on editing or revision a 'pass'. As soon as I saw your 'on revision' and Lucy Burdette's 'very wise words about editing" I devoured your informative blog. I was converted by the Faber course I took on writing fiction in which the tutor, Helen Shipton, required us to write, comment on others' writing and then re-write our own. Reluctantly, I learned the importance of revising, and editing. Then I heard a friend, in an interview, claim that she 'loved' the editing and rewriting period of creating her novels. That decided me to learn to enjoy it as well -- and I did. When the editor of my most recent book (a memoir) sent me his report, however, I did your 'slow roll', took a deep breath, and strove to keep a 'light heart'. Most of my editor's comments were of your 'What's the point?' variety in an effort to have me focus on the central narrative. I decided that if I want to be a writer, I must trust my (highly experienced) editor and so I cut or rewrote a la your point 4 above more than 25% of my manuscript. Haha! Yes, Ronald, the Faber Academy online program is great. I took the "Writing a Novel" course while writing The Reluctant Fortune-Teller, in fact. Hearing criticism is never a delightful experience, I guess. How could it be? But you know what they say: if it were easy, then everyone would be doing it. Do you find that editing--and accepting the corrections/ suggestions of your beta readers, tutor or editor--get easier with time? Congrats on the new book, Keziah! It's quite an amazing feeling to know that your words will be released out into the world! My mom is my "positive encourager," which some people find hard to believe. It sounds as those she and your daughter are similar in their approaches in that they find what works and what doesn't while being kind and supportive. I couldn't ask for a better first reader! Thanks for the congrats, Ingrid. It truly is amazing, and what I am most looking forward to is connecting with readers. I know that "positive encourager" is a funny and redundant phrase, but I like its sunny emphasis. Good to know that you have one, too! Dear keziah, thank you for the valuable tips.i think revision is both hard and wonderful. I am writing my first book and even as I am writing I know I am going to be coming back a number of times to redo bits and work on areas that are not sounding right now. But that sort gives me the confidence to move on since I know I can come to this again later.. otherwise I would just be stuck and not able to finish my book. But thank you for the pointers - I know about loving a scene and not wanting to let go of it. I need a positive encourager but I have shared bits of my work but scared to show the whole thing to anyone as yet (am about 75%) done. But am going to find my positive encourager... Thanks and look forward to reading your book. Yes! Getting through the rough draft is said to be the way to go! Once you do that, you have something to work on. I would say, trust your instincts about showing your work to anyone. I attended an event at a bookshop where the writer Mary Kubica said she doesn't show her work to anyone until it's all done; then it goes out all at once to her agent, editor and husband. The other presenter, Gilly Macmillan (also a wonderful novelist) said she wrote her first novel in secret. They agreed that there as many ways to write a novel as there are novelists. Thanks so much for your writing tips. Informative! I admit that I just scrolled through the comments and your responses I apologize if you already answered this question. Why did you choose to have a man as your main character? I would think that it’d be easier for you to write from a woman’s point of view. Great comments from the jungle red authors. I’ve been reading their Facebook page for awhile. They are a very friendly bunch. Jane, that is an interesting question. I would have to say that I didn't choose to have a man as my main character. The story rolled out in front of me with its characters still vaguely defined, but from the beginning Norbert was going to be the fortune-teller. Almost every character in the book is female, and there is a very strong one called Carlotta who kept trying to take over and be the protagonist. I am surprised myself that my novel has a male protagonist; I never would have expected that. But in some strange way, it's as if the story already existed somewhere and was given to me, and I never dreamed of changing the gender of the main character. That's just the way it was. Does that sound crazy? Congratulations! I'm going to keep an eye out for your book; it sounds intriguing. I also have wanted to be a novelist since my school days and am approximately 3/4 finished with my first draft. I am curious about something: why do you and so many others choose to use a pen name? I have always assumed I would use my own, but maybe there's some reason I should not? Great question! In my case, it is because I would like to keep my writing life separate from my other career life. I work as a psychotherapist, and like to keep a boundary there. I have a non-fiction, self-help book out there under my "therapist name," and don't want to confuse readers, either. Other reasons for pen names: sometimes a writer writes in 2 different genres, or wants a new start, and a different name establishes this new "brand." However, if you would enjoy having everyone in your life that you know and love to see a pile of books with your name on them at the local bookstore and promoted online, then that is part of the reward, and using your own name is definitely an option that many--probably most--writers take. You are 3/4 finished! That is great! Keep going! Let me know when you finish! I am cheering for you.